General Hospital (GH) spoilers reveal a shocker for the Jason Morgan reveal this week, November 27-December 1 and a new promo video, The Real Jason (see below), offers some tantalizing clues. Naturally the video begins with a tense scene to set the mood – after Billy Miller’s Jason Morgan arrives at the PCPD and quickly confronts P6 (Steve Burton), Sam (Kelly Monaco) stands by her husband as he tells SB Jason they are not brothers no matter what the DNA says. GH’s brilliant and talented attorney, Diane Miller, who has represented both twin brothers in the past, arrives at the precinct and orders TPTB to get on with it already, as the bros deserve to know the truth. She demands that they all be told what they rightfully should know – which one is their beloved Jason Morgan and who is the less beloved Drew. An image of a computer screen reveals that a fingerprint match has been found. 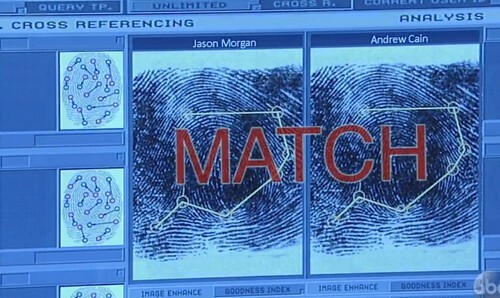 And this screen shows a fingerprint match for Jason Morgan and Andrew Cain! So according to the video promo Jason Morgan IS Andrew Cain – but who is Andrew Cain? Are we being told that Drew is Jason and is Drew Billy Miller or Steve Burton? Facts are that as of now GH fans will have to wait to see which brilliant actor ‘is’ the real Jason Morgan! General Hospital spoilers tease that the intriguing dilemma has brought familiar faces like Dr. Robin Scorpio Drake (Kimberly McCullough) to Port Charles and the GH PROMO reveals that Damian Spinelli (Bradford Anderson) may get twisted into the thick of things too. It will be interesting to see how Dr. Kim Nero (Tamara Braun) fits into all of this, because clearly she knew one of the brothers, when they looked like Port Charles’ original Jason Quartermaine and original Jason Morgan. The question remains, does she know the real Drew, or does she know one of them AFTER the twin memory mapping? General Hospital sources reveal that the fingerprint match with be a really shocking twist and we, as GH fans, are guaranteed to be on for the emotional ride of our lives when it comes to explaining this mystery over the next 8 months. Be sure to tune into ABC’s General Hospital (GH) to catch up on everything happening right now in Port Charles and do not miss out on the revelation about to occur about the twin brothers’ identies. Check Celeb Dirty Laundry often for updates, news, rumors and spoilers!